Ground crew of XXI Bomber Command use a bulldozer to put out a fire that consumed a B-29 hit by the Japanese air raids of November 27, 1944. At 0005 Hours two G4M (Allied code name "Betty") bombers attacked Saipan, destroying Z Square 1, serial number 42-24659, a Boeing B-29-40-BW Superfortress of the 877th Squadron, 499th Bomb Group, 73rd Bomb Wing. At 1210 Hours, seventeen A6M Zero-Sen (Allied code name "Zeke") fighters from Iwo Jima also attacked Saipan. They caught B-29s that were still loaded with bombs and fuel on ground after they aborted the 73rd's mission to Tokyo. All Japanese were shot down by anti-aircraft artillery or fighters, but they destroyed A Square 9 "Skyscrapper," serial number 42-24599, a Boeing B-29-40-BW Superfortress, 869th Squadron, 497th Bomb Group; T Square 10, serial number 42-63428, a Bell-Atlanta B-29-15-BA Superfortress, 873rd Squadron, 498th Bomb Group; and V Square 42 "Hell's Bells," serial number 42-63438, a Bell-Atlanta B-29-15-BA Superfortress, 879th Squadron, 499th Bomb Group. One Zero crashed onto the field; another came down 100 yards (91.4 meters) from the 879th's crew quarters. P-47s from the 318th Fighter Group shot down two A6Ms during the raid and two more over Pagan Island at 1300. XXI commander Major General Haywood S. Hansell said, "I jumped in my jeep with Col. John B. Montgomery, my Chief of Staff, and headed for the field. As we came up a rise onto the flying field, I found myself looking straight into a Japanese fighter that was strafing the area. I brought the jeep to a halt and sought shelter under it. Quick as my reaction had been, it still was not quick enough. Colonel Montgomery was already there." Radar was not yet installed, which anger General Henry "Hap" Arnold, who commanded the operation from Washington. Japanese aircraft raided Saipan 80 times between November 2, 1944-January 2, 1945, destroying eleven B-29s and damaging 43. This led to the need to eliminate Iwo Jima as a fighter base. The last Japanese aircraft was seen over Saipan on February 2. 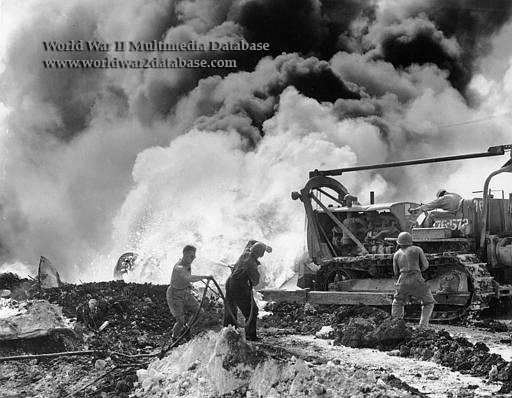 Iwo Jima was invaded on February 19.